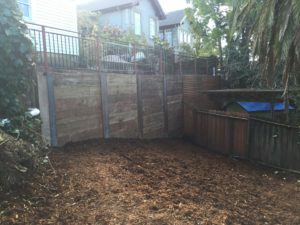 What Exactly Is A Retaining Wall? For the purposes of our work, a good definition of a retaining wall is a structure made of wood, concrete, brick, block, etc. whose function is to retain soil or other materials where the height of those materials is greater on one side than on the other. 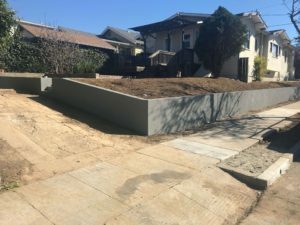 Retaining walls are often installed to hold up soil outside of the building adjacent to patios or in sloped areas of the yard, or they are used for foundations where the interior grade is lower than the outside level such (in excavated basements, for example). When the height of the material (generally soil) that is higher on one side causes uneven forces on the wall, then the wall is subject to either overturning or sliding. A retaining wall is designed to resist those forces, usually with the use of an L-shaped footing (for concrete walls) with a base approximately 1/3 to ½ the height of the wall to prevent overturning, and a notch (or keyway) at the end of the footing extending farther down to prevent sliding. These walls are heavily reinforced with rebar to give them greater strength. This type of retaining wall works well when the area on the downhill side of the wall is level, e.g. when there is a patio below, or a basement under the house. 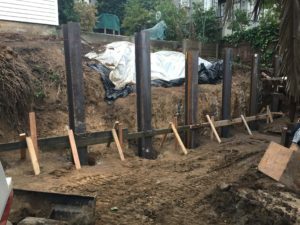 When there is a slope on both sides of the wall or the soil on the downhill side is in poor condition, we will often drill piers (usually to a depth around twice the height of the wall, depending on the soil conditions) and install steel I-beams set in concrete to perform a similar function. By drilling deep into stable soil, this type of wall will resist sliding and overturning as well (see below). Pressure-treated wood timbers are placed between the steel beams to fill in the wall, and they will be resistant to moisture over time. A French drain is also installed behind the wall to remove water from behind the wall. The advantage to a wall with piers is that the supports are deep enough that they are not generally affected by drainage or soil movement near the surface where they tend to be most significant. Older walls, especially those around 4’ or less in height, were built as “gravity walls”, which means they had little if any footings and were designed to stay up based upon their mass and weight. This will often be sufficient for many years, but eventually they start to lean and at some point fail due to movement of soil behind them–often related to lack of drainage. This is an example of a typical leaning gravity retaining wall. All the trees and vegetation behind the wall did not help matters, as roots and their expansion helped push this wall down over time. 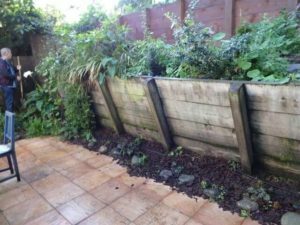 All vegetation was removed and we rebuilt the wall with a French drain behind it to relieve future water pressure from behind the wall. 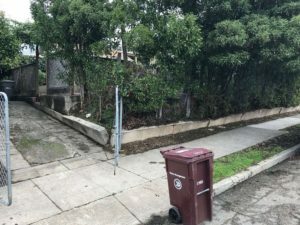 That drainage pipe was brought under the sidewalk and out to the street, as you can see in the picture where there is new concrete at the sidewalk and the curb. 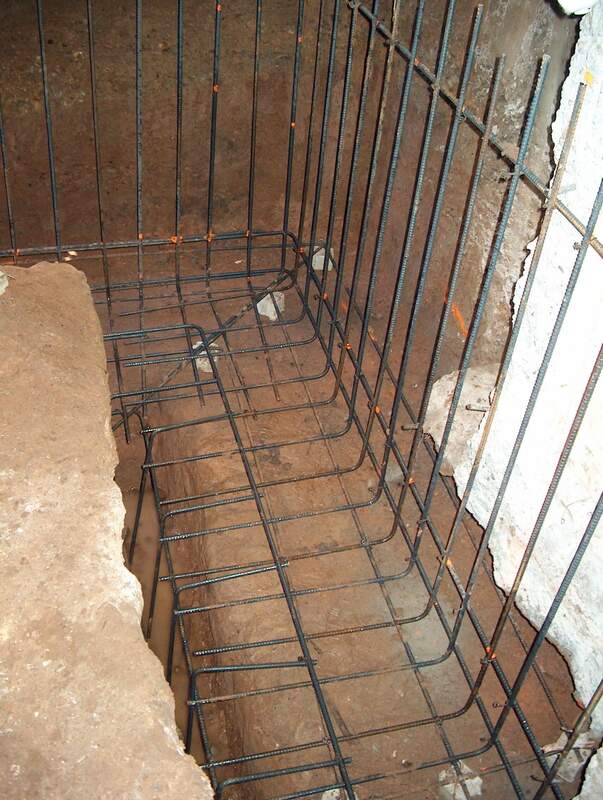 The rebar extended in the footing for the wall (below the dirt in the space between the sidewalk and the wall). We added a stucco texture coat to the concrete for low maintenance and to create a finish similar to the stucco on the house. More than likely these posts are shallow (often 2’ deep rather than the suggested 4-6’ deep average) and not able to withstand soil movement. 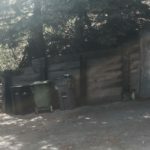 Since the wood posts are set in dirt, they will often rot at the ground level due to exposure to moisture, and this will occasionally occur in a relatively short time (5-10 years) if they go with new growth redwood which is not very resistant. Wood posts should be set in concrete above the ground level so they are not exposed to a lot of water. These walls often lack drainage as well. They depend on water to weep out between the wallboards. Sometimes they have drainage holes that clog. Installation of a drainage mat or a proper French Drain will ensure more effective drainage over the long term. This wall had drilled piers about 15’ down. Walls built with shallow piers are done primarily to save money and avoid drilling, but they do not fare well over time. 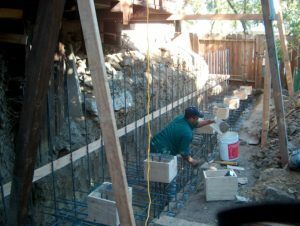 Most concrete retaining walls in Bay Area CA where we work fail due to inadequate footings, lack of drainage, and a lack of reinforcement. 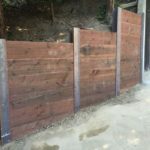 For wood walls with posts, it’s generally shallow piers, lack of drainage, and the lack of pressure-treated wood members. Modern properly engineered walls are more expensive, but are more economical in the long term since they should last a lifetime rather than requiring frequent reconstruction if they are done improperly.